... Is not really a celebration. I've been a mom for almost 3 years now but for the past two years it was just a day to wish my mom Happy Mother's Day and forgetting that I'm a mom too. Anyway this year I had a pleasant surprise from my baby girl Khayla. I wasn't expecting anything out of the ordinary when I fetched her from school last Friday. As usual when I arrived, I honked to let the teachers know since I couldn't leave my baby Khadeeja unattended in the car. From afar I saw Khayla's teacher helping her put on her shoes and holding her hand as they walked to the school gate. Khayla was holding a red piece of heart-shaped paper in one hand which I assumed was her school project. In the other, it appeared like she was holding a small branch. When they stepped out of the school gate, it turned out she was holding a bouquet of carnations, which the teacher explained with a smile, is a Mother's Day gift from the school. 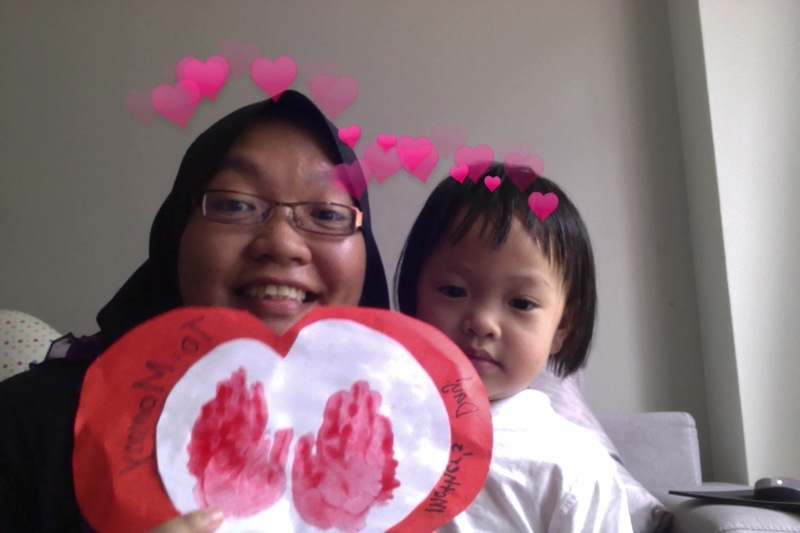 But she quickly told that Khayla also has her own gift - a Mother's Day card which she made herself! Being a mom is not always easy for me. 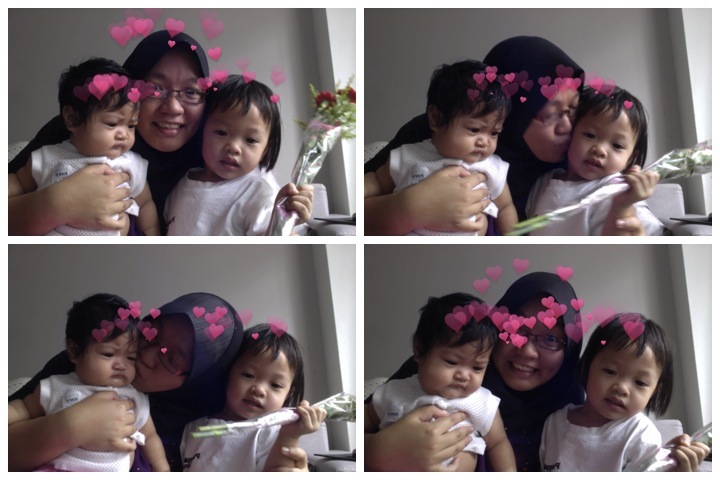 When I had Khayla two years ago, I was so overjoyed to receive the much-awaited child of ours that I overlooked a lot of the challenges of being a mom. Khayla was a clingy baby but I did not notice because I was as clingy to her as she was to me. When Khadeeja arrived, although I was as thrilled to welcome my second baby and love her as much as I love my firstborn, that elated feelings sort of toned down considerably with experience of raising a baby before. I began to see things in a more practical manner, and being practical is just so… exhausting. Having a precocious toddler and an active baby means I have to do everything quickly and fit things around their clocks. For example, cook three dishes in less than 15 minutes. Accompany Khayla in the toilet and while waiting, wash Khadeeja's dirty diapers. Read my study notes while they are busy playing (5 minutes tops before Khadeeja wails to be picked up), breastfeed her while feeding Khayla. But every time I thought I just want to throw up my hands in surrender / exasperation, the kids will do something to remind me how lucky I am to have them around, even though nothing much gets done and I'm living in a pigsty. Things like flinging their arms around me in a tight hug. Mouth-to-mouth kisses. Khadeeja's wild chuckles and bright eyes as I make funny faces or sounds, or tickle her. Khayla's very adorable gwiyomi acts and just the way she says 'Ma-mak'. To this, I wish myself 'Happy Mother's Day' because it is just that - being a mother is a happy experience, every single moments every day. Alololo sweeetnya Khayla bg present untuk mommy dia.... Happy Mother's Day Carney!! Hehe. Tu la, tak sangka dia buat kad Mother's Day kat sekolah. Terharu aiiii!